“If you preserve it, they will come” seems to be the story of Monteverde. However, during a recent visit to this world-renowned conservation area, we discovered an intrinsic side to Monteverde that has remained concealed under the flashier facets of conservation, cloud forests, and an amazing variety of wildlife. This is not meant to diminish Monteverde’s well-deserved fame, which has greatly influenced local economic, social and cultural development. Nor should we forget that over half a century ago, Quakers from the United States’ South adopted these lands as their own, thus creating a vast positive influence in what is today Monteverde. Nor should we leave out the ideals of peace with man and respectful coexistence with nature, which the Quakers persistently employed when creating a new place in which to live in accordance with their principles, beliefs that have resulted in the wonderful oasis of sustainability and harmony that Monteverde has become. Here, we will share with you another of Monteverde’s qualities: its Costa Rican soul. The first Costa Rican families in the area arrived at the beginning of last century. At that time, Monteverde was nearly inaccessible. 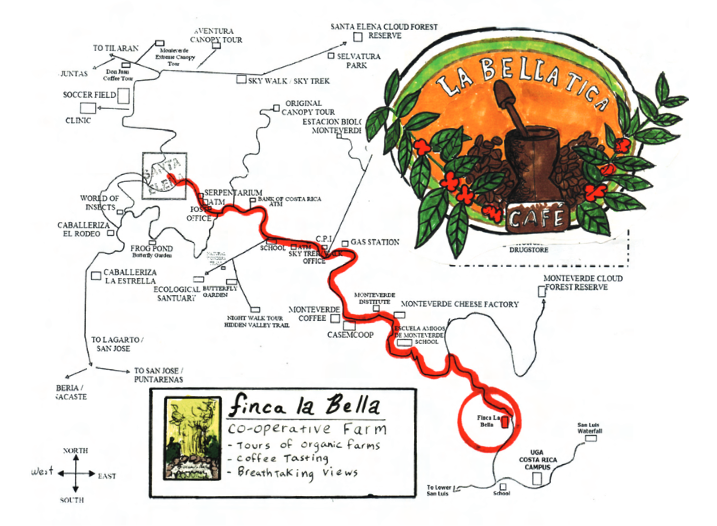 However, settlers arrived to plant Costa Rica’s signature crop: coffee. Like most Costa Ricans at that time, they slowly began planting sugar cane, beans, corn, and plantains in addition to coffee. A few cattle ranchers came in. Subsistence agriculture took hold. The Quakers arrived and protected large tracts of forest in order to preserve their source of water. Shortly thereafter, “technical tourists” arrived: biologists and foreign students attracted by the abundant, unique wildlife. These adventurers let the world know about Monteverde’s riches. From this newfound fame, restaurants and lodging popped up for visitors. With the tourism boom, many Costa Rican families who lived near the Monteverde Reserve moved to outlying areas in order to continue their agricultural traditions. The second half of the twentieth century brought many changes to Monteverde. The first electric power plant, the first car, first telephone systems, and first homemade cheese and ice cream factories arrived. Then creature comforts like refrigerators, milking machines, coffee grinders showed up, brought by the Quakers. As more and more foreign visitors extolled the virtues of the area, an embryonic version of sustainable development grew along with the Costa Rican families and their customs. But Monteverde doesn’t stop there. Because of the Costa Rican families who wished to keep their traditions alive, there is a type of rural agricultural tourism that stoically preserves the flavor of yesterday. Old farms seem to be lost in time, with their original infrastructure intact. Tourists can thus garner a vivid cultural experience here. 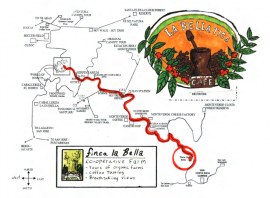 The Bella Tica Coffee Tour teaches visitors all about coffee and more, which offers Costa Rican farmers the chance to make a little extra money on top of their agricultural activities, and all of which offer visitors the chance to connect with our deepest roots.